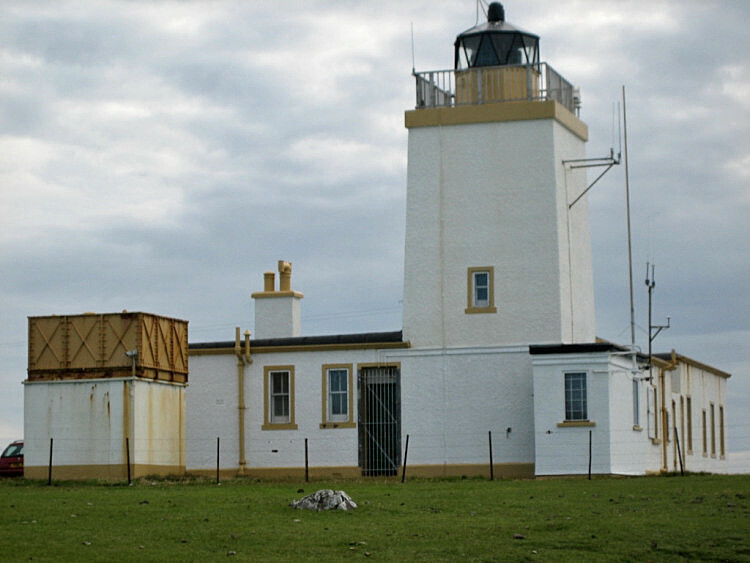 This was the last manned Northern Lighthouse Board major facility designed by a member of the Stevenson family, in the long line of Stevenson-designed lighthouses in Scotland. A temporary light, on an iron tower, powerful enough to give warning of the Ve Skerries eight and half miles offshore was erected in 1915 on the Eshaness peninsula on the north-west coast of mainland Shetland. This light was torn down after World War One. The current Lighthouse was built in 1929 from concrete because of the unsuitability of local stone. The 37ft tower sits on top of a 200ft cliff. Eshaness was not totally effective in keeping ships away from the Ve Skerries. A trawler from Aberdeen wrecking in the area soon after it was build and all hands were lost. Due to the increase in heavy oil-tanker traffic to and from Sullom Voe, in 1979 a lighthouse was built at Ve Skerries, and Eshaness was used as the construction site for it. The small keepers quarters was unusual in that it was home to only one keeper, when normally there would be three. It was sold to private owners in 1974 and now operates as self-catering holiday accommodation. White square tower with lantern and gallery, rising from 1-storey keeper's house. Accessible by road (4WD recommended). Site and tower closed, but it can viewed from outside the enclosure.